Cairns is a must at this tropical destination, and we have plenty of Cairns tours so you can enjoy this tropical paradise. With easy connections for both domestic and international travellers and unsurpassed natural beauty, add in fine dining and a laid back tropical lifestyle and it is easy to see why tourist are including it on their Australian holiday. For visitors short on time the Great Barrier Reef and World Heritage Rainforest can both be visited on the same day, although those with more time should immerse themselves in the area. 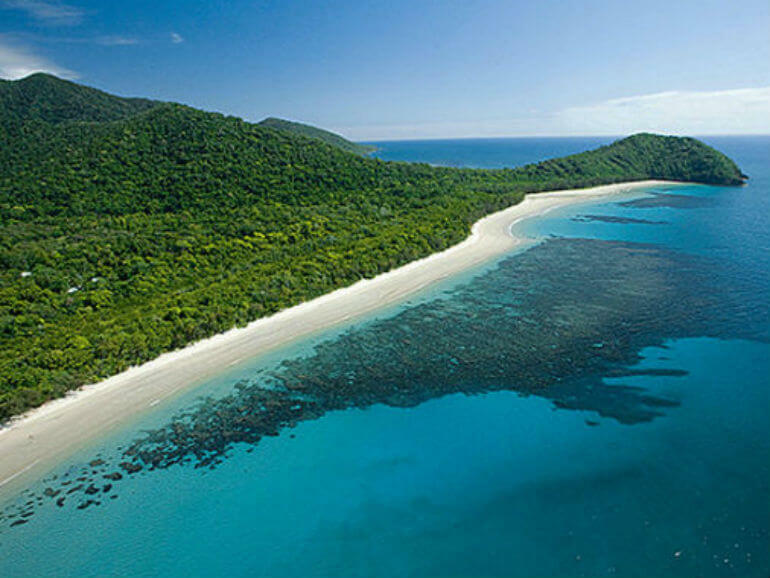 Port Douglas, Daintree, Cape Tribulation, Mossman Gorge and Kuranda are all easily accessible on day trips. If it is adventure you are seeking then Tropical North Queensland has you covered with skydiving, bungy jumping, parasailing, rafting and now sea-bobbing and fly -boarding. Young or old Cairns has your holiday needs covered. BusCairns public transport network is the Sunbus service which services the main business district and Northern beaches areas (Sunbus). Taxis are a convenient method for point to point travel in Cairns. Throughout Australia dialling 13CABS (132227) will put you in touch with the nearest Taxi service. Taxis can also be pre-booked. A Taste of Paradise in Port Douglas. But it isn’t all about the food, there is a street parade, sporting events, arts, comedy and music, as well as the family beach day with a kite festival and Sandcastle and sculpting competitions. An ocean swim, a bike leg on one of the most scenic coastal roads in Australia and a run around the Cairns esplanade, sounds idyllic but this is an IRONMAN event so the only ones enjoying the view are the spectators. A proper country rodeo just one hours drive west of Cairns. Get up close to the bull riding, calf roping or wood chopping. The rodeo festival runs for two weeks and culminates in two days of rodeo action. Three days of exhibitions, displays, sideshow rides and show bags, this is the regional show not to miss. Peoples day is on the Friday so the crowds will be larger, but the centrally located showgrounds handles this with ease. A series of events to celebrate life in tropical north Queensland. There is a street parade, fireworks, music and arts. The events are scattered throughout the city with the focus on the tourist hub of the Cairns Esplanade. September is the perfect time of the year to visit Cairns and Amateurs is the perfect event. Whether you want to get immerses in the horse racing or the fashion in the field or the social events surround the track action this is North Queensland’s social calendar highlight. Claimed to be the hardest, longest and most adventurous Mountain bike races in the world the Croc trophy is a multi-stage ride staged over 1,000 klm in Far North Queensland. The gruelling event has been running for over 20 years and is the longest running MTB stage event. There is a family friendly firework time (9pm) and a carnival, followed by the midnight fireworks and celebrations on the esplanade. Public transport buses do not stop at the Cairns Airport. This is a convenient way to get to and from the airport directly connecting with your destination. The Taxi ranks are located at the front of both the international and domestic terminal. Pre-booked taxis are advised if you have special needs. In most parts of Australia, including Cairns dialling 131008 will put you in touch with the local taxi service. Most of the major car rental companies have outlets located at Cairns Airport, Avis, Budget, Europcar, Hertz, Thrifty and Redspot. (Vroom Vroom Vroom) There are rental car counters in the arrivals area at each terminal. There is a covered walkway between the domestic and international terminals. The walk takes less than five minutes. With so much to do in Cairns it is hard to decide what to do when you are only there for a long weekend. We have put together our suggestions for the perfect itinerary. 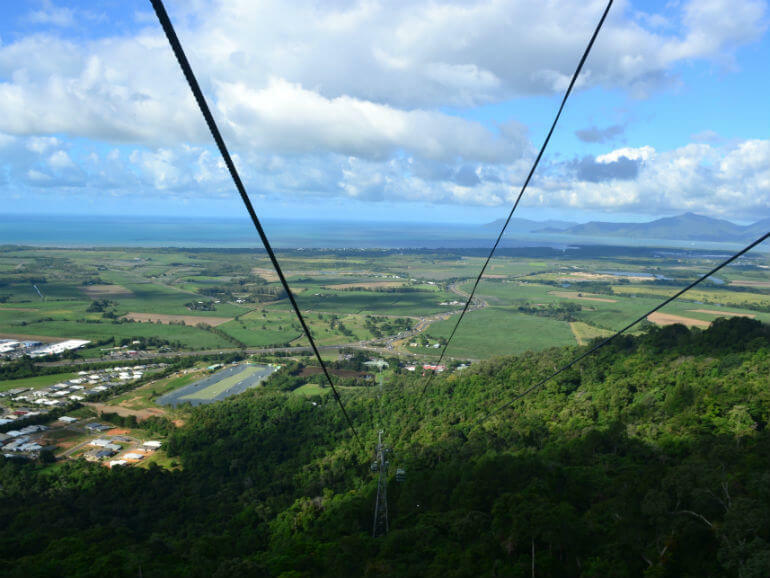 One of Cairns’ most popular tours is to visit Kuranda by travelling on the Kuranda Scenic Train and the Skyrail Rainforest Cableway. We took the journey and rediscovered why it is so popular. With so many Skyrail and Train options available we have produced this guide that simplifies your choices for you. 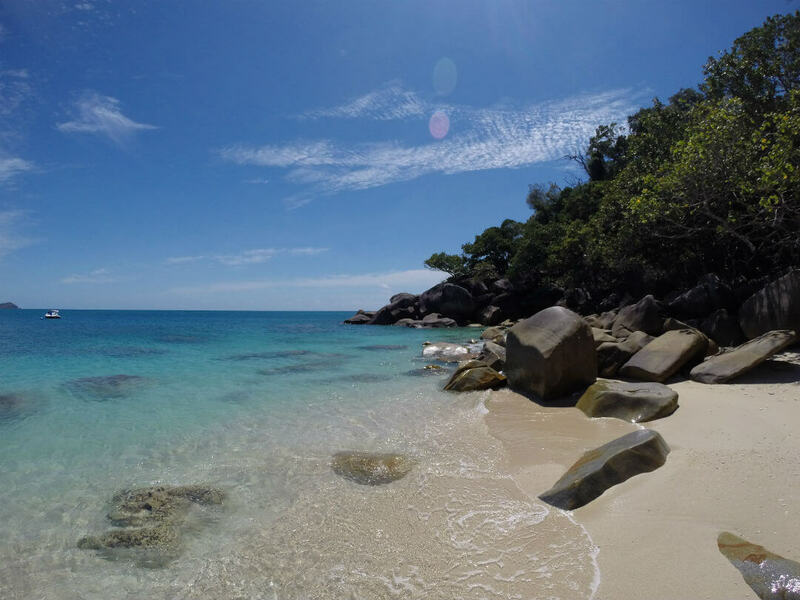 Just 45 minutes by ferry from Cairns, in mostly protected waters is Fitzroy Island. This continental island offers snorkelling, crystal clear waters, coral and sand beaches and for the more active excellent views from the summit lookout. 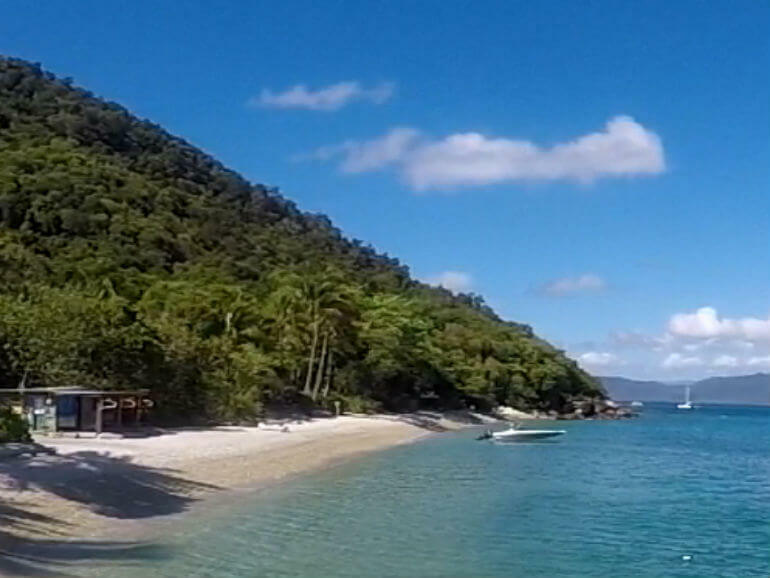 Green Island is a short boat ride from Cairns and offers an Island based Great Barrier reef experience. You can swim, snorkel, glass bottom boat or just relax on the beach. It is the perfect island getaway. One of the best places in North Queensland, to learn about crocodiles is at Hartley’s Crocodile Adventures. They have both Fresh and Esturine Crocodiles as well as Kangaroos, Koalas , Snakes and Cassowaries. Taking a 9 year old to an Outer Great Barrier reef pontoon turned out to be a wonderful way to spend a day on Moore reef. So much to do we barely crammed everything in. A perfect way to spend a North Queensland winters day. Breakfast at Palm Cove, Mossman Gorge Visitors Centre and then Port Douglas, even spotted a croc in the wild! Having just spent a day at the Outer Great Barrier Reef with my family I can highly recommend it for tourists and locals alike. The reef is amazing and the crew were fantastic. Port Douglas is considered the gateway to the only area of the world where two World Heritage listed sites meet, the Great Barrier Reef and the Daintree National Park. Picture the Great Barrier Reef and the world’s oldest rainforest separated only by beautiful beaches and you’ll get an idea of what tropical paradise in North Queensland is all about. Just north of Cairns, and next door to Skyrail, is Tjapukai Cultural Park. Learn about the traditional owners of the area, their stories and culture. You can even combine it with time on the popular Skyrail Rainforest Cableway. I often say to people that winter in Tropical North Queensland is very similar to some of the best summers I’ve experienced around the world. Blue sky days, perfect temperatures and no shortage of fun things to do. The islands and coral cays on the great Barrier Reef just off Cairns are ……..
Cairns is not only the gateway to tropical wonders such as the Great Barrier Reef, Daintree Rainforest and Port Douglas, but it’s also a spectacular holiday destination in its own right. Experience some of these unique Cairns tours and attractions this summer and see the best this stunning city has to offer. When people attempt to list the locations that encapsulate the beauty of Australia’s landscape, a few places always make the list. The Far North Queensland city of Cairns is one of those places! The Bed & Breakfast and Farm Stay Association of Far North Queensland offers a wide range of accommodation options throughout Far North Queensland. From Traditional B’n’Bs and farm stays to self contained cottages and outback stations. Wherever you are staying in the Cairns area, and whatever the type of accommodation you require BNBNQ can help you. Located directly opposite Trinity Beach, with its own lagoon pool, this 4.5 star apartment accommodation is one of Cairns’ most well appointed resorts. For your own piece of luxury in paradise it is hard to look past Shanee Prana, 5 bedrooms, an acre of manicured gardens, a swimming pool, tennis court and easy access to everything Cairns and the Northern Beaches has to offer. There is so much to do here, or choose to do so little….. Just 50m from Clifton Beach in your exclusive cottage with private access. Relax on the deck or in the tropical gardens. Stay one night or stay a week. An award winning wild life retreat situated in the rainforest along a spring fed creek. There are only six suites on the property that boarders a national park so finding your own private space is assured. Two bedroom house set on 5 acres with a seasonal creek, this is the perfect getaway for up to six guests. Only 10 minutes from Kuranda and 30 minutes from Cairns surrounded by rainforest and a beautiful garden. Yungaburra is the perfect base to explore the Atherton Tablelands and the Curtain Fig is the perfect place to stay. Cosy, quiet, well equipped rooms and a friendly atmosphere with off street parking and just a short walk to the heart of Yungaburra. The Great Barrier Reef, its tropical islands, coral cays and abundant marine life are just a short boat ride from Cairns and there are so many options you will want to spend more than one day at the reef. For a truly amazing experience nothing beats an outer reef day trip from either Cairns or Port Douglas, you can take a ride on one of the smaller boats or for more facilities head out on one of the larger boats and spend the day on a reef pontoon. When you get there you can take an introductory dive or snorkel, and to see the reef without getting your feet wet try the glass bottom boat. For the ultimate dive experience take a multi day cruise. You will get to dive at a variety of locations and at different times of the day so you can see the reef in all its splendor. If your sea legs aren’t as good, or you just want to laze on a tropical island then maybe a trip to Green, Low, Fitzroy or Frankland Islands will be more your style. The reef is still spectacular, the coral sands are amazing and you can even find a secluded spot on the island to call your own. The kids can spend their day finding Nemo or playing on the beach while you watch from under a shady palm tree, it doesn’t get more idyllic. For a very different perspective on the reef take a helicopter ride while you are there, or if you are short of time, skip the boat and fly to the reef. If you want to find out more we have articles on The Great Barrier Reef, Fitzroy Island and how to choose between an Island, Boat or Pontoon Based reef trip. If you want to experience the Wet Tropics World Heritage listed rainforest then the Kuranda Scenic Railway and Skyrail make the perfect combination. The railway was build to supply miners on the Atherton Tablelands and was completed in 1891, comprising of 15 tunnels and more than a dozen bridges all built by hand. The rail line is now a major tourist attraction providing a unique perspective on Cairns and the surrounding rainforest. The rail line curves around Stoney Creek Falls and Glacier Rock and stops at the magnificent Barron Falls before arriving in the quaint village of Kuranda. The Skyrail Rainforest Cableway glides you just above the canopy allowing you to look down through this ecosystem. 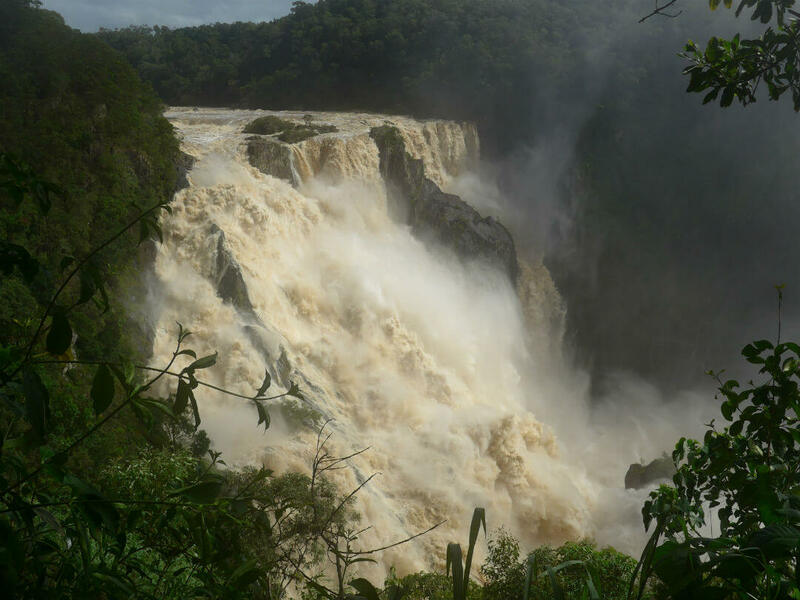 Stopping at two intermediate stations, Red Peak and Barron Falls gives you the opportunity to view the area at your own pace. There are rangers on hand to answer your questions and guided walks available. Both trips can be done as return journeys, although it is recommended to travel one way on each. If you want more information on this popular activity then read our tour review here, or our booking guide here. The Daintree Rainforest is the largest continuous rainforest area in Australia at over 1,200 square kilometers. The significance of this area has been recognised with the listing of the Wet Tropics World Heritage Area and a plan by the government to buy back tracts of privately owned land. The natural beauty of the area will surprise you and in places the rainforest grows right down to the beach. It is truly an area that needs preservation. There is an abundance of wildlife including the elusive cassowary, a large flightless bird that despite it size can easily vanish before you get a chance to take out your camera. A Daintree River cruise is an ideal way to see both the flora and fauna and to go crocodile spotting, winter is the best time for this as the crocs come up onto the banks of the river to sun themselves. Cape Tribulation is accessible by a sealed road after crossing on the Daintree River ferry. This restricted ferry access has limited development in this area and adds a unique touch to visiting Cape Trib. A unique feature of this area is it is the only place in the world where two world heritage areas, the Wet Tropics and the Great Barrier Reef, are side by side. The traditional owners, the Eastern Kuku Yalanji people, understood this area, its seasonality and food sources and lived successfully in the area. The area was name by Captain Cook as the point where all his troubles began, but now it is a place where you can leave all your troubles behind and relax as one with nature.